As of February 2018, the MTH website continues to show the use of an NTE50 latching DPDT relay to control a Tortoise switch machine from an AIU SW(itch) port. The suggested relay is now obsolete and even when in production was quite spendy (over $25). The required functionality to operate a Tortoise switch machine via the AIU's SW(itch) port is a so-called LATCHING DPDT (double-pole-double-throw) relay. Suitable "bare" or loose unmounted relays can be had for just a few dollars but require soldering and such. There are assembled DPDT relay modules with screw-terminals but are around $15 each. Here's a DIY method for about $5 out-of-pocket and does not require soldering to tiny relay pins. 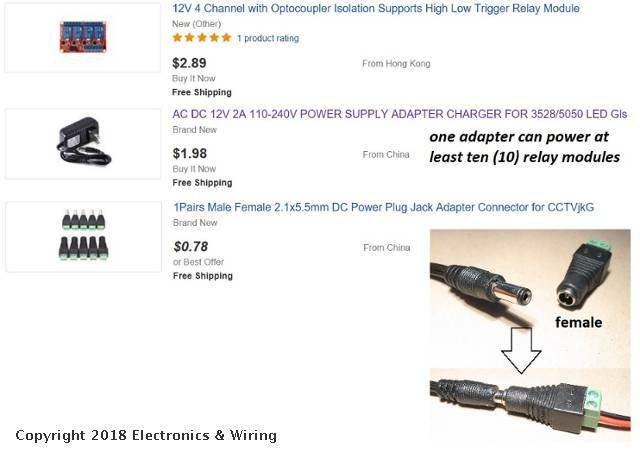 Additional ports would be less the $3 out-of-pocket as a single 12V DC power adapter can power multiple (at least 10) ports. Again, this method does require careful attention to detail and is perhaps more of a thought-provoking idea than a practical solution. In any case, here's the concept in action ... albeit driving a bi-directional DC motor rather than a Tortoise switch machine. Note: using this method, when the relay module is first powered, it always starts in the "OFF" or unlatched position. This can be wired to be the "straight" or "diverge" position. The point being this is different than a true mechanically-latching relay which remembers its position between operating cycles. There are features within MTH DCS command-control to set multiple SW ports to a pre-determined configuration. 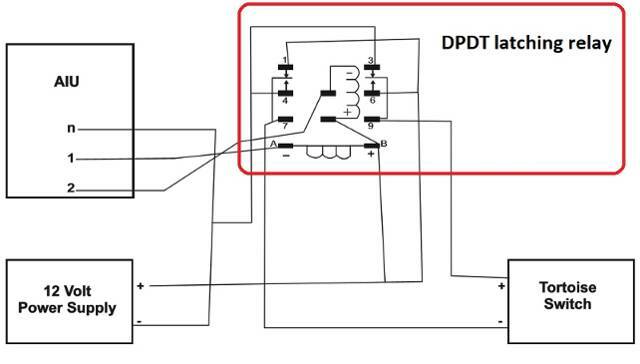 Note: DPDT relay is used to reverse (invert) the polarity of a DC voltage to the switch machine DC motor. If AC voltage is available to drive the switch machine(s) then only a single-pole SPDT relay is required. This method is described in the Tortoise literature. A latching relay is nevertheless required. 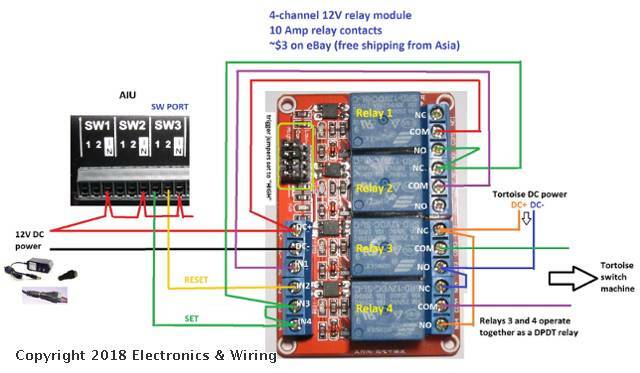 In this case, Relay #3 can be the SPDT relay and Relay #4 is not used.